Congress is about to make a big decision that has drawn far too little notice. The Senate plans to vote this week on a proposal to overturn a Consumer Financial Protection Bureau guidance against discriminatory auto lending. We are talking about an industry with a long and sordid history of making nonwhite borrowers pay more than similarly situated white borrowers — often a great deal more. Against that background, a vote in favor of the Senate measure would be a vote in favor of letting auto dealers and lenders continue charging some borrowers more simply because of the color of their skin. Car buyers who need financing most often obtain through the dealers selling them their vehicles. Unknown to most buyers, dealers typically receive backdoor rewards from lenders — kickbacks, in plain English — for getting customers to accept loans that are more expensive than their income and credit history qualifies them for. In practice, these so-called dealer mark-ups have long been a driver of racial discrimination, as well as a source of unfairness all around. In the mid-1990s, a series of class-action lawsuits were brought against the largest auto finance companies. The data from those cases conclusively showed that African-American and Latino car buyers were more likely than white borrowers to have their interest rates marked up, often costing them thousands of dollars more than similarly situated white borrowers. It would be nice to think such practices had been consigned to the dustbin of history. But we know better. In January, the National Fair Housing Alliance published a report in which white and nonwhite test-consumers shopped for the same car at roughly the same time. More often than not, a better qualified non-white applicant was offered higher-cost financing options than a less qualified white applicant. The added expense for these borrowers came to an average of more than $2,500 over the life of the loan. Despite all the evidence, the federal government did little to address this widespread problem until the Consumer Financial Protection Bureau came along. In 2013, the Consumer Bureau issued a guidance warning auto dealers and lenders to follow the Equal Credit Opportunity Act, and not to discriminate in either the making or pricing of loans. The CFPB partnered with the Department of Justice in enforcement actions against Ally Financial, Honda, Fifth Third Bank, and Toyota — actions that generated more than $150 million in fines and delivered restitution to some 425,000 borrowers. In June 2015, the Bureau began to oversee the auto lending practices of nonbank financial companies, which had pretty much escaped all federal regulation. The auto dealers’ and lenders’ arguments are beyond specious — they talk about keeping “auto loans affordable and accessible for all consumers,” when what they are really seeking is the freedom to generate kickbacks through practices that consistently result in borrowers of color paying more. For too many lawmakers, however, evidence and logic appear to count for nothing when they hear from a powerful and ubiquitous industry. Ironically, these votes roughly coincide with the 50th anniversary of the Fair Housing Act, which prohibited discrimination in the financing as well as the sale and rental of residential property. Discriminatory lending in all its forms has come to be understood as an important factor in perpetuating the profound racial wealth gap that is one of our country’s great shames. It is a very sorry sign of the times that many of our elected representatives in Washington would even consider voting for such a measure. But it is not too late for Senators to reconsider a vote that would not only countenance the continuation of one particular, deplorable form of injustice but also send a terrible message about their commitment to justice and equality across the board. It is time for Senators to look themselves in the mirror and decide if they really and truly care more about currying favor with an influential and financially generous industry than about equal rights under the law, and fairness for people of all races. In April 2017, the Consumer Financial Protection Bureau sued four companies, Golden Valley Lending, Silver Cloud Financial, Mountain Summit Financial, and Majestic Lake Financial, for using sham tribal-sovereignty claims to collect debts on loans that violated an array of state laws as well as the federal Truth in Lending Act. On January 18, 2018, the bureau moved to dismiss its lawsuit. After an initial statement attributing the decision to “professional career staff,” Mick Mulvaney backtracked, acknowledging his own involvement. The case took years to build, and the idea of dropping it was opposed by the “entire career enforcement staff,” National Public Radio has reported. Here is what we know about the companies, their operations, and the allegations against them. The four companies used their websites and online ads to make tens of millions of dollars of loans at 440% – 950% annual interest. Between August and December 2013, Silver Cloud and Golden Valley originated roughly $27 million in loans and collected $44 million from consumers. A typical $800 loan called for payments totaling approximately $3,320 over ten months — the equivalent of 875.5% annual interest. Interest rates on all the loans examined by the CFPB ranged from 440% to 950%. The Consumer Bureau sued them for engaging in unfair, deceptive, and abusive business practices by attempting to collect payments on loans that were void in whole or part under the usury and/or licensing laws of 17 states. Their loans were illegal, according to the complaint, in Arizona, Arkansas, Colorado, Connecticut, Illinois, Indiana, Kentucky, Massachusetts, Minnesota, Montana, New Hampshire, New Jersey, New Mexico, New York, North Carolina, South Dakota, and Ohio. Golden Valley and the other companies carried on with their lending and collection activities even after the Attorneys General of several states sent cease-and-desist letters. The companies were charged with violating a Truth in Lending Act requirement that all advertising for closed-end credit state finance charges in annual percentage rate terms. In addition, according to the complaint, customer service representatives consistently failed to include that information in answers to questions raised over the phone by applicants or customers. The four companies claimed to be protected by tribal sovereign immunity. Based on ties to a small Native American tribe in Northern California, they asserted that their loans would be “governed by applicable tribal law” regardless of where the consumer “may be situated or access this site.” The companies made this claim despite a United States Supreme Court ruling in 2014 that tribes “‘going beyond reservation boundaries’ are subject to any applicable state law.’” Numerous courts have held that when a loan is made online, the transaction is considered to have taken place wherever the consumer is located at the time. Despite recent legal victories, states can have a hard time, without federal help, going after online lenders that break state laws. Through the use of shell companies, “lead generators,” and various legal ploys, online lenders — including the companies named in this lawsuit — have been able to keep state authorities at bay for years. Whether tribal ties really give payday loan companies a right to assert sovereign immunity remains a murky legal issue: the courts have allowed some state lawsuits to proceed while blocking others. But tribal businesses cannot invoke sovereign immunity against the United States. That’s one reason why the federal government’s ability to act is so important. The business practices of Moseley’s operation and the four defendant companies closely resembled those of another Kansas payday lender, the race-car driver Scott Tucker, also recently convicted of federal racketeering charges. Like Golden Valley et al, the lending companies run by Tucker and his lawyer-partner Timothy Muir did business through a call center located in Overland Park, Kansas, and relied on a claim of tribal sovereign immunity, based in their case on ties to an Oklahoma tribe. The Tucker-Muir companies, featured in the Netflix documentary series “Dirty Money,” used similar contractual language to obscure their practice of defaulting customers into a many-months-long series of payments that got applied entirely to loan fees, making no dent in the balance. Tucker and Muir were convicted in January 2018 of racketeering, wire fraud, money laundering, and violations of the Truth-In-Lending Act. Payments collected by Tucker’s businesses went into accounts at U.S. Bank, whose parent company, U.S. Bancorp, has agreed to pay $613 million in civil and criminal penalties for what the Justice Department described as a “highly inadequate” anti-money-laundering system that failed to flag these and other suspicious transactions. The Tucker-and-Muir story is another illustration of the need for action at the federal level if online payday lenders are to be stopped from evading state laws and continuing to exploit consumers. When a financial flim-flammer scatters to the wind or goes bankrupt, its victims are typically out of luck. But when the Consumer Financial Protection Bureau is on the case, the story can have a better ending. Just in the past three months, the CFPB has sent over $100 million to an estimated 60,000 victims of a sham debt-relief company, Morgan Drexen, that went bust after collecting up-front fees for services it mostly never delivered. The CFPB’s ability to bring a measure of justice to Morgan Drexen’s defrauded customers rested on authority granted by Congress. It works like this: When a solvent company is caught breaking the law, the bureau orders that company — Wells Fargo, let’s say — to make restitution to its victims. But that is only part of the remedy. The Dodd Frank Act, which set up the CFPB, gives it the additional power to levy a civil penalty — both to discourage further wrongdoing by the company involved, and as a warning to others. That money goes into a fund that the CFPB can use to deliver relief to those ripped off by malefactors who are no longer in a position to pony up. Stuck servicemembers with illegally expensive consumer loans by artificially inflating the prices of the electronic products they were financing. Will the bureau be able to go on providing that sort of help? OMB Director Mick Mulvaney arrived at the bureau on Monday claiming to be its interim director. One of the first things he did was to announce that payments from the victim compensation fund would be suspended for at least 30 days. No big surprise, perhaps, from an anti-consumer ideologue who has called the CFPB a “sick, sad joke,” and, as a congressman, voted again and again for measures to curb its authority, funding, and political independence. 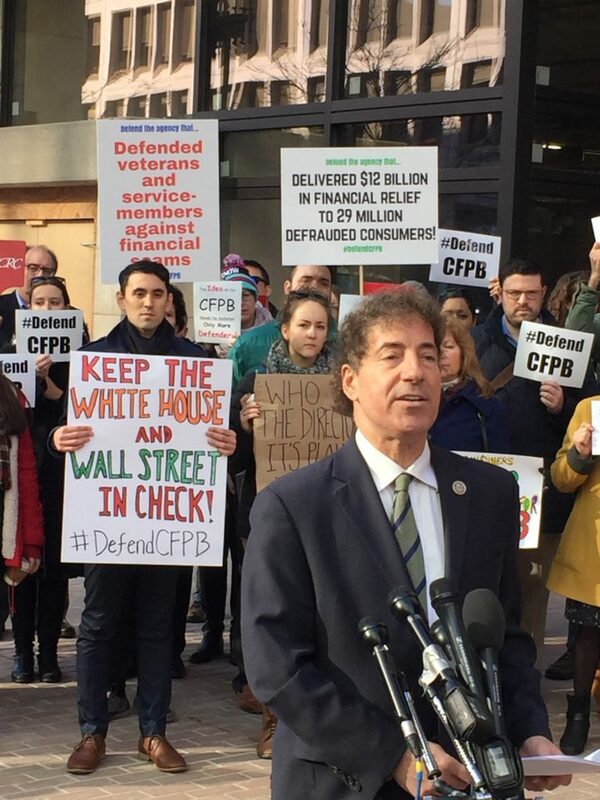 Joined by Rep. Jamie Raskin, consumer advocates gathered outside the headquarters of the Consumer Financial Protection Bureau today to defend the mission of an agency that’s delivered $12 billion in relief to over 29 million Americans in its short life. 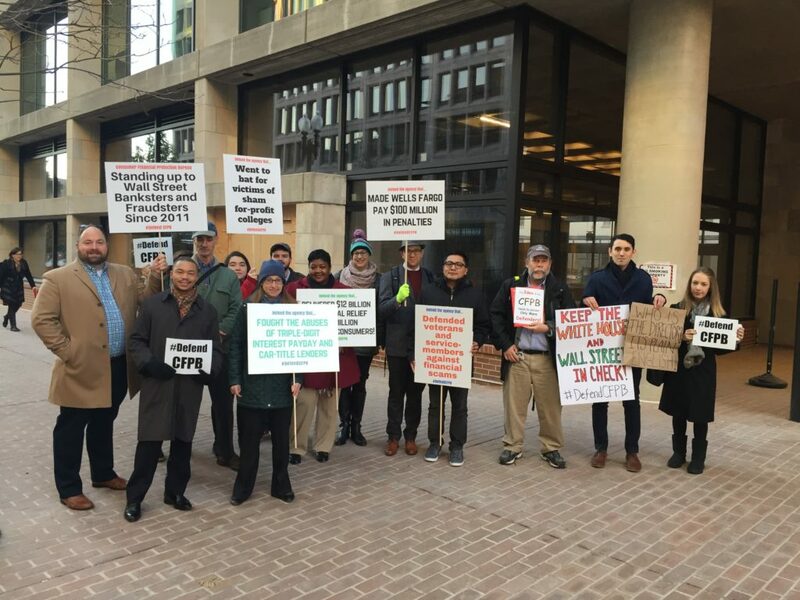 “Standing up to Wall Street Banksters and Fraudsters since 2011,” read one of the signs that greeted CFPB employees heading into their offices for their first day under a new, but not yet decisively identified, leader. The “Vigil to #DefendCFPB” came hours after Acting Director Leandra English filed a lawsuit to prevent President Trump from installing Mick Mulvaney, the director of the Office of Management and Budget, to run the consumer bureau. Mulvaney also arrived at the CFPB today, with a load of donuts for the staff. But it will take more than donuts to legitimize Mulvaney’s role. It will take a court ruling, or Senate confirmation of a permanent replacement for Richard Cordray, who stepped down as Director of the CFPB last week. Rep. Jamie Raskin of Maryland also addressed the gathering, which was broadcast via Facebook Live. “Not only does ordering President Trump’s OMB Director Mulvaney to moonlight as the CFPB director contradict the plain language of the CFPB statute but it also makes a mockery of the idea of an independent federal agency,” said Raskin, a former constitutional law professor. The vigil became the backdrop for reports by CNN, CNBC, Fox News, and NPR on the Trump administration’s effort to hamstring the CFPB’s work. Donner also spoke to The Associated Press. The hashtag #DefendCFPB began trending on Twitter later in the day. Raskin had harsh words for Trump’s appointees to regulatory bodies after campaigningas the champion of the little guy. Between the attempted designation of Mulvaney and the accomplished appointments of Education Secretary Betsy DeVos and EPA head Scott Pruitt, “President Trump has temporarily succeeded in putting the Joker, the Riddler and the Penguin in charge of Gotham City,” Raskin said. Under the Dodd-Frank law that created the CFPB, the president nominates the head of the agency, who must be confirmed by the Senate. Cordray, the former director, won the votes of 66 senators in 2011. “Now, the president should nominate someone with a track record of fighting for consumers who will enjoy bipartisan support in the Senate,” Donner said. Last Wednesday, a majority of judges expressed skepticism of PHH’s arguments that the CFPB’s structure is unconstitutional during oral arguments at the U.S. Court of Appeals for the D.C. Circuit in PHH Corporation vs. CFPB. In its relatively short life, the Consumer Financial Protection Bureau has brought basic rules of fairness and transparency to credit markets, while holding predatory lenders and financial wrongdoers like Wells Fargo accountable. It has also delivered – so far – nearly $12 billion in relief to more than 29 million consumers cheated by financial companies of one kind or another. Across party lines, poll after poll shows overwhelming support for the actual work the CFPB has been doing, and for more, not less, Wall Street regulation in general. Even most Trump voters, according to one recent survey, oppose efforts to weaken or eliminate the Consumer Bureau, and would rather see the Dodd Frank financial reforms (which created the CFPB) maintained or expanded than scaled back or repealed. So what should we make of a new industry-funded poll that supposedly demonstrates wide backing, in eight battleground states, for a move to turn the Consumer Bureau into a “bipartisan commission”? “This poll is a quintessential example of a survey that has been designed to produce a specific result — one that is at odds with everything else we know about public opinion on consumer protection and Wall Street reform,” according to Celinda Lake and Daniel Gotoff of Lake Research Partners. Here’s something it proves beyond any doubt: if you write a poll question artfully, you’ll get the answer you’re after. Put the label “bipartisan” on just about anything, for example, and people will say they’re for it. But the warm and fuzzy picture that word conjures up – of political independence, cooperation, and roll-up-your sleeves pragmatism – is a very far cry from the reality of the “bipartisan commission” sought by the lobbyists who commissioned this survey. Gridlock would be the far more likely outcome. A truly telling survey would provide voters with information about the entities that the CFPB regulates, highlight the importance of independence — non-partisan action — in this position, according to Lake and Gotoff. Polling and focus groups with transparent professional methodologies show that large majorities of voters from every demographic favor giving federal agencies the tools they need to enforce the law on the financial services industry. Just consider the record of the various commissions charged with regulating the financial industry in the years leading up to the 2008 financial and economic meltdown. Two of them, the Federal Reserve and the Securities and Exchange Commission, could have done a lot to prevent that disaster. Neither did much of anything. That’s the historical pattern, and that’s why the industry is so fond of this regulatory structure. The impetus for making the CFPB a commission isn’t coming from voters or consumers; it’s coming financial industry executives and lobbyists like the ones who paid for this poll – and from the far too many elected officials who seem to be prepared to do their bidding with little regard for the wishes or interests of their constituents. The list of hazards faced by first responders to the Sept 11th terror attacks is a long one. In addition to cancer, respiratory disease, and post-traumatic stress, the perils include financial scammers out to raid their medical compensation benefits. In a federal lawsuit filed earlier this month, the Consumer Financial Protection Bureau (CFPB) and the New York Attorney General’s Office accuse a New Jersey company, RD Legal, of targeting firefighters, paramedics and police officers who rushed into the rubble of the World Trade Center. “We allege that this company and its owner lined their pockets with funds intended to cover medical care and other critical expenses for people who are sick and sidelined,” Consumer Bureau Director Richard Cordray said. RD Legal’s modus operandi, according to the CFPB’s complaint, was to “swoop in” after victims had been awarded compensation but before they received it. The company would offer to “convert your settled cases into immediate cash,” and then charge illegally high interest on top of fees buried in the fine print of a long contract; some of its loans ended up costing the equivalent of 250% annual interest, the two agencies allege. The Consumer Bureau was created after the 2008 financial crisis to do a simple job: get banks and lenders to treat people fairly. One way it does this is through enforcement actions which have so far delivered nearly $12 billion in refunds and relief to some 17 million Americans cheated by financial companies large and small. In the RD Legal case, the Bureau is seeking to end the scam, impose monetary penalties, and force the company to return what could be millions of dollars to affected consumers. One of the potential beneficiaries is Elmer Santiago, a NYC police officer who was living in his jeep when he agreed to borrow $355,000. Eighteen months later, RD Legal handed him a bill for $860,000. Some people may have been seduced by the company’s promises to “cut through the red tape” and speed up their compensation. In fact, RD Legal provided no such help, according to the lawsuit. RD Legal is a hedge fund and a player in what is known as the litigation finance industry, using wealthy investors to bankroll cash advances for lawsuits and settlements.The owner and founder of RD Legal, Roni Dersovitz, was named in the action, along with two affiliate entities. 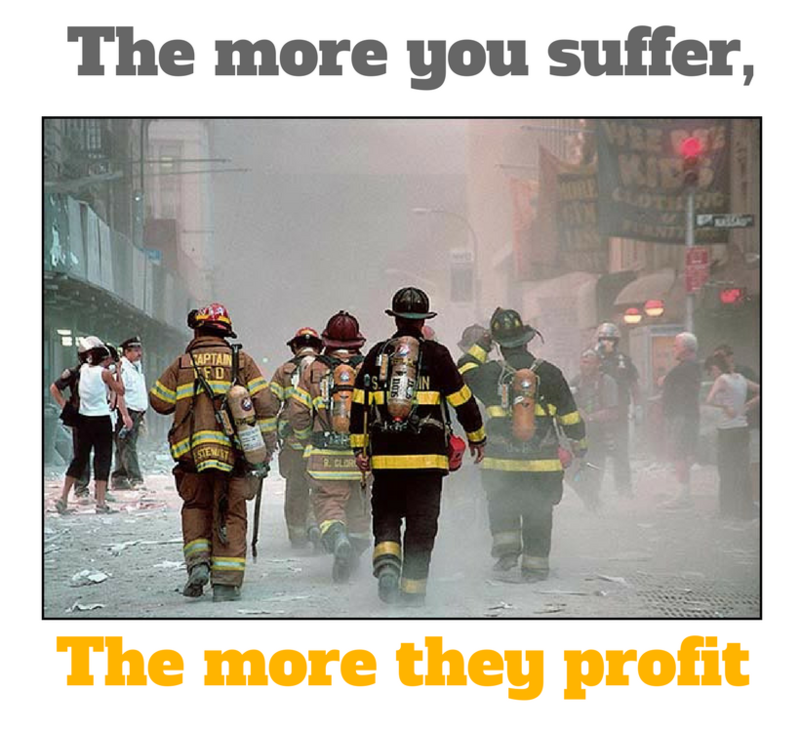 Dersovitz was previously sued by the SEC for defrauding investors and exploiting Beirut bombing victims. The Consumer Financial Protection Bureau (CFPB)’s first enforcement action of 2017 will return more than $17 million to consumers who were deceived into purchasing unneeded credit reporting products. On January 3, 2017, the CFPB issued a consent order against TransUnion, LLC (TransUnion) and Equifax Inc. (Equifax) and their respective subsidiaries and affiliates for making false claims about the usefulness and actual cost of the companies’ credit score services. TransUnion and Equifax are two of the nation’s three largest credit reporting agencies. They collect consumers’ credit information in order to generate credit reports and scores to be used by businesses to determine whether to extend credit. These companies also sell their own products directly to consumers, including credit scores, credit reports, and credit monitoring. According to the order, TransUnion and Equifax told consumers that they would receive the same score typically used by lenders to determine their creditworthiness. But that claim was false: in fact, the scores they sold to consumers were rarely used by lenders. Since at least 2011, TransUnion has been using a credit score model from VantageScore Solutions, LLC (VantageScore) — a model not used by the vast majority of lenders and landlords to assess consumers’ credit. Similarly, between July 2011 and March 2014, Equifax used its own proprietary credit score model, the Equifax Credit Score, which was in the form of “education credit scores” and thus intended for consumers’ educational use and rarely used by lenders. In fact, the most widely used scores in lending are FICO scores. TransUnion and Equifax also falsely advertised the price of their services. They told consumers that their credit scores and credit-related products were free, or in the case of TransUnion, cost only “$1.” In reality, the companies required consumers to sign up for either a seven-day or 30 day free trial period of credit monitoring, which then automatically turned into a monthly subscription costing $16 or more per month, unless the consumer had cancelled by the end of the free trial. 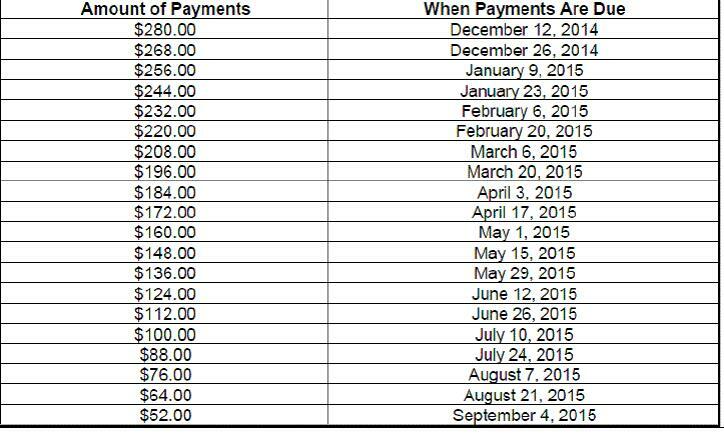 This payment structure, called “negative option billing,” was not adequately disclosed in the companies’ ads. Credit reporting agencies are required by law to provide a free credit report once every 12 months. They are not allowed to advertise add-on services until “after the consumer has obtained his or her annual file disclosure.” The CFPB found that Equifax violated that requirement. The CFPB has ordered TransUnion to pay more than $13.9 million in restitution to affected consumers, and Equifax to pay almost $3.8 million, in addition to fines of $3 million and $2.5 million respectively. The companies have also been directed to truthfully and clearly describe the usefulness of their credit score products, and to obtain consumer consent before enrolling anyone in automatic billing. Consumers who want access to their credit reports for free should go to the official source: www.annualcreditreport.com. They can stagger their requests by ordering one report from each of the Big Three credit reporting agencies (Equifax, Experian, and TransUnion) every four months, essentially obtaining “credit monitoring for free.” In addition, many consumers can now get a FICO score for free through the FICO Open Access program from participating credit card companies or nonprofit credit counselors. This month the Consumer Financial Protection Bureau (CFPB) took action against three reverse mortgage companies for promising seniors a financial product that was too good to be true. The CFPB’s investigation determined that several of the claims the companies made in TV and print ads were not true. All three companies “tricked consumers into believing they could not lose their homes” with a reverse mortgage, CFPB Director Richard Cordray said in a statement accompanying the Bureau’s announcement of the settlements it has reached with Reverse Mortgage Solutions, Aegean Financial, and American Advisors Group, which is the largest reverse mortgage lender in the United States. A reverse mortgage is a special type of home loan for homeowners who are 62 or older, that converts a portion of the equity that has been built up over years of paying a mortgage, into cash. Homeowners do not have to repay the loan until they pass away, sell, or move out of the house, or fail to meet the obligations of the mortgage. These three companies promised consumers that their reverse mortgages would eliminate debt without any monthly payment obligation. In fact, a reverse mortgage is itself a debt and consumers are required to make regular payments related to the home, including for property taxes, insurance and home maintenance. Consumers can default on a reverse mortgage and lose their home if they fail to comply with the terms of the loan, including making such payments. The CFPB provides information for consumers about reverse mortgages on its website. Consent Order in the Matter of American Advisors Group, No. 2016-CFPB-0026 (Filed Dec. 7, 2016), at 6 (“American Advisors Group Consent Order”). The Consumer Financial Protection Bureau (CFPB) filed a lawsuit against Access Funding, LLC (Access Funding) for operating an illegal scheme that took advantage of victims of lead-paint poisoning. “Many of these struggling consumers were victimized first by toxic lead, and second by a company that saw them as little more than income streams to be courted and harvested,” the CFPB said. Access Funding is a structured-settlement factory company that purchases payment streams from personal-injury settlement recipients in exchange for an immediate lump sum that is usually much lower that the long-term payout. Forty-nine states have enacted laws, known as Structured Settlement Protection Acts (SSPAs), which require judicial approval to protect injured people from scams. According to the CFPB’s November 21 lawsuit, Access Funding and its partners aggressively pressured consumers to accept up-front payment amounting to about 30 percent of the present value of the money due to them, and lied to them by saying that once they had received a cash advance they were legally obligated to proceed with the transaction. Knowing that many of the consumers in this case had suffered cognitive impairments from lead poisoning, the CFPB’s complaint alleges that the companies exploited their “lack of understanding” in order to lock them into these arrangements. About 70 percent of Access Funding’s deals were done in Maryland, where it was headquartered. Many SSPAs, including Maryland’s, require consumers to consult with an independent professional advisor (IPA) before a court can approve such a deal. According to the lawsuit, Access Funding steered almost all its Maryland consumers to a single attorney, Charles Smith, who purported to act as the IPA, while having both personal and professional ties to Access Funding and its partners. Smith, who was paid directly by Access Funding, gave virtually no advice to the consumers. Complaint at 7, CFPB v. Access Funding, LLC, No. 1:16-cv-03759-JFM (D. Md. Filed Nov. 21, 2016) (“Complaint”). Press Release, Consumer Financial Protection Bureau, CFPB Sues Access Funding for Scamming Lead-Paint Poisoning Victims Out of Settlement Money (Nov. 21, 2016) (“Press Release”).